Laoag City and Laibin in China entered into a formal tie-up to become sister cities, when Mayor Michael Farinas and Laibin Mayor Zhang Shaokang signed an agreement, which provides avenues to assist each other in attaining progress, and promote goodwill through the implementation of development programs. The signing ceremony took place in Nanning, the capital of Autonomous Region of Guangxi Zhuang, on Oct. 25, 2005. 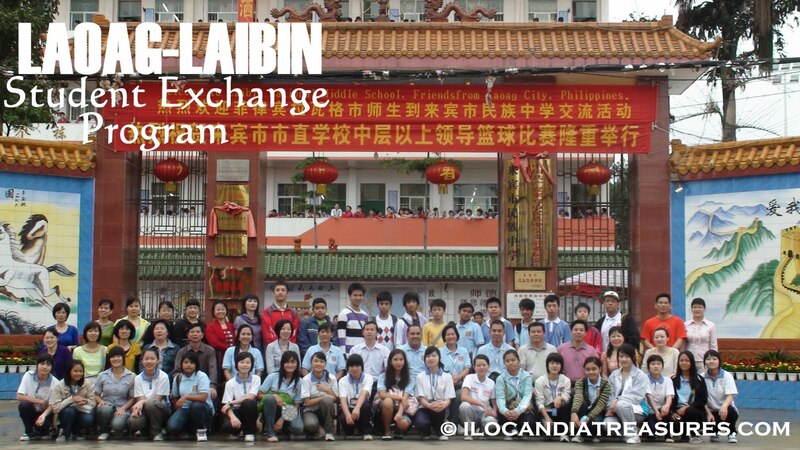 One of these programs is the Laoag City-Laibin City Student Exchange Program for 2010, which was implemented last May. Headed by city schools education supervisor Lloyd Rosquita, the delegation included teacher-advisers Marlyn Ventura, Lorna Balisbisana, and Lilia Calventas; and students Kathrina Balisbisana, Denise Nacnac, Emmalaine Ramos, Andrea Dumlao, Eileen Lauricio, Fatima Tolentino, Kevin Riton, Paolo Ablan, Francis Chua, Kenneth Mata, Christopher Guerrero, Edizon Arcartado and Anna Mae Abraham. The author joined the delegation as representative of a non-government organization. It was a 13-day visit to China. The delegation took a flight from Manila to Guangzhou in Guandong province, our entry point to China. We were met by Mr. Charly Zhang, an official from the Department of Foreign Affairs of Laibin, who is in-charge of the exchange program. We were rode on a bus to Laibin. Most of us slept during the almost 9-hour trip to the Chinese city. Exactly at eight o’clock of the following morning, we arrived at the Laibin National Middle School where almost all the students lined the gates, doors and corridors; they had been waiting for us. We were surprised as we have just woken and freshening up. Everyone was cheering as we got off at the bus, treating us as if we were superstars. Our student participants were matched and introduced to their partner families. We had photo session at the school’s main gate with the school master, Mr Chen, teachers and students. As the Laoag City student delegates were taken by their partner families to their respective homes, we the adult delegates were taken to Redbud City Hotel where we were billeted. Then a welcome dinner reception was tendered for us at the Laibin Yuda International Hotel by the director of the Foreign Affairs Department of Laibin, Mr. Meng Zhie Jian and other high ranking officials of the Department of Education. It was a night of fun. We visited various middle schools of Laibin. The delegates learned the bamboo dance with some of the students of Zhuang nationality clad in their ethnic costumes. We all played with the locals skipping the rope, shooting the embroidered balls, kicking the shuttlecock, legging running race, wooden shoe competition and doing the crab back balloon. They also taught us on how to make the dumplings and cook other Chinese food. We had fun eating them. A demonstration on how to administer a tea service was executed by some students and teachers. We were taught to sing with them some Chinese folk songs and they taught us to write our very own names in a Chinese calligraphy class session. A side trip to Guilin, a beautiful spot in Guangxi, was a big treat by the Laibin government to us. We visited the amazing Elephant Trunk Hill, its landmark. We entered into to the majestic Reed Flute Cave full of stalactites and stalagmites. We had a wonderful cruise to the four lakes and two rivers, the Li and Peach Blossom. On this cruise we have seen the miniature of the Golden Gate Bridge and other landmarks. We passed by the Pagoda twin towers. We had night shopping at Zhong san Road. We also visited the Seven Star Scenic Area Park on a following day, the historic spot where former US President Clinton delivered his speech advocating the protection of the environment. We dropped by Liuzhou Teachers College for some exchange ceremony. We did not let the chance to go by without seeing the laser water music show by the river at Liuzhou downtown. It was a fantastic show and lasted for 30 minutes. In Xincheng County, we saw the Xincheng Motusi Yamun built during the Ming dynasty made of brick and wood which look like a Chinese traditional palace. It is being called the Imperial Palace of the Zhuang nationality. We visited the Hydropower plant with the second world’s biggest equipments after Japan supplying the entire Guangxi. We have seen the process of making aluminum in a factory in Xingbin district. 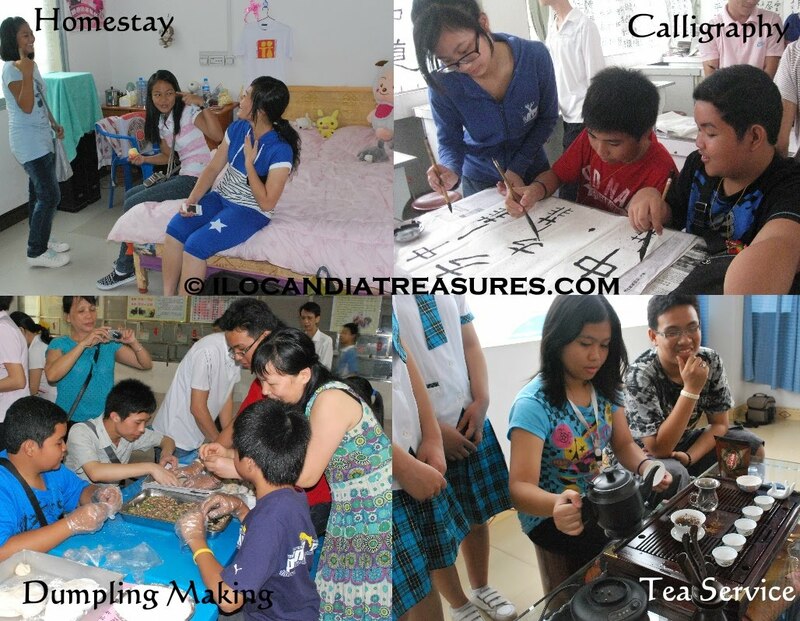 At Heshan City, we were warmly welcomed by the students and teachers upon visiting their schools. We have seen the treasures of the city, the peculiar stones. It was an experience of a lifetime! Laibin served as our home away from home and we were sad to leave and bid farewell to our new-found Chinese friends. We will truly miss them but not for long as the Laibin delegation is expected to arrive in Laoag this August. We look forward to seeing our brothers and sisters from China again!